본 연구에서는 국내 의료, 제조, 금융, 자동차, 도시 분야와 해외 광업 분야에서 머신러닝 기술이 활용된 사례를 조사하였다. 문헌 조사를 통해 머신러닝 기술이 의학영상 정보시스템 개발, 실시간 모니터링 및 이상 진단 시스템 개발, 정보시스템의 보안 수준 개선, 자율주행차 개발, 도시 통합관리 시스템 개발 등에 광범위하게 활용되어왔음을 알 수 있었다. 현재까지 국내 광업 분야에서는 머신러닝 기술의 활용사례를 찾을 수 없었으나, 해외에서는 광상 탐사나 광산 개발의 생산성 및 안전성을 개선을 위해 머신러닝 기술을 도입한 프로젝트들을 찾을 수 있었다. 향후 머신러닝 기술의 광업 분야 도입은 점차 확산될 것으로 예상된다. This study investigated use cases of machine learning technology in domestic medical, manufacturing, finance, automobile, urban sectors and those in overseas mining industry. Through a literature survey, it was found that the machine learning technology has been widely utilized for developing medical image information system, real-time monitoring and fault diagnosis system, security level of information system, autonomous vehicle and integrated city management system. Until now, the use cases have not found in the domestic mining industry, however, several overseas projects have found that introduce the machine learning technology to the mining industry for improving the productivity and safety of mineral exploration or mine development. In the future, the introduction of the machine learning technology to the mining industry is expected to spread gradually. 최근의 이산화탄소 심지층 처분, 인공지열저류층 형성 및 발전, 원유회수증진 사업 등에는 고압의 유체를 주입하는 과정이 수반되고 이들 사업의 안전하고 성공적인 수행을 위해서는 대상 부지 절리 암반의 투수 특성 및 주입압에 의한 역학적 변형에 기인한 변화를 정확하게 평가하는 것이 중요하다. 본 고에서는 절리 암반 수리-역학 특성 파악을 위한 해석적 및 실험적 평가 방법에 대해 검토하였다. 먼저 유체 주입 전 절리 암반 초기 투과 특성 및 수리-역학 특성 평가에 고려해야 할 기술요소를 분석하고 현장 시추공 실험을 통해 이들 수리-역학 특성을 직접 측정하기 위한 최근의 SIMFIP 실험장치의 특징 및 활용방안에 대해서도 검토하였다. Permeability and its change due to a fluid injection in jointed rock mass is an important factor to be well identified for a safe and successful implementation of Carbon Capture and Sequestration (CCS), Enhanced Geothermal System (EGS) and Enhanced Oil Recovery (EOR) projects which may accompany injection-induced hydromechanical deformation of the rock mass. 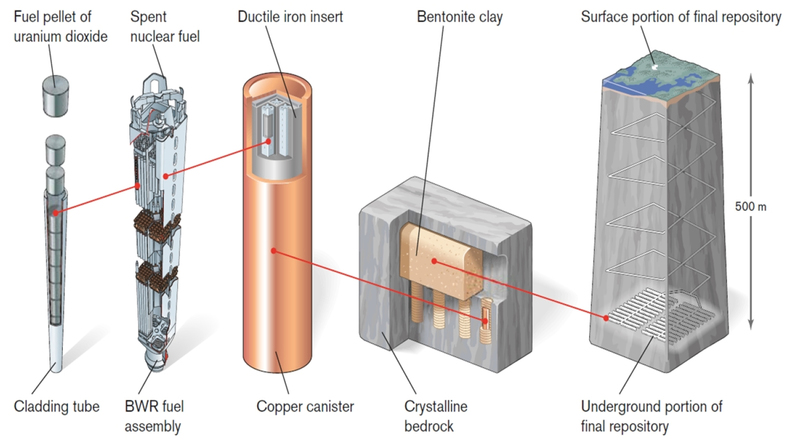 In this technical report, we first reviewed important issues in evaluating initial permeability using borehole hydraulic tests and numierical approaches for understanding coupled hydromechanical properties of rock mass. Recent SIMFIP testing device to measure these hydromechanical properties directly through in-situ borehole experiments was also reviewed. The technical significance and usefulness of the device for further applications was discussed as well. 해외의 일부 광업 선도국에서는 정량적인 설계지침을 제시하거나 별도의 광산 갱도 설계지침을 개발하여 배포함으로써 지하광산 운영 시 대규모 인적･물적 피해로 이어질 가능성이 높은 낙반 및 붕락 재해의 발생을 최소화하기 위해 노력하고 있다. 국내의 경우에는 광산안전기술기준 등 광산개발 관련 지침을 통해 근로자 사고 방지를 위한 안전수칙과 작업지침을 제공하고 있으나, 갱도설계에 대한 부분에서는 정성적이고 불명확한 시공 지침만을 제공하는 데에 그치고 있다. 최근 국내 환경규제 및 천부 자원 고갈로 인해 광산이 점차 심부화되고 있는 추세이며, 갱도의 안정성을 확보하기 위해 정량적인 설계 규격을 제공할 수 있는 전문적이고 체계적인 광산 갱도설계 지침에 대한 수요가 증가하고 있다. 이에 따라 본 원고에서는 국내외 광산 갱도설계 실태와 연구동향 및 현행 설계지침에 대한 현황 조사를 통해 국내 갱도 설계지침 개발을 위한 사전연구를 수행하였다. Some leading countries in mining have a very quantitative guideline for underground mine opening design which is useful to minimize mine hazards such as rockfall and collapse. Those hazards sometimes can cause a huge damage on human life and property in the mines. Construction guidelines of underground mines in Korea consist of qualitative and general expressions although the workers’ safety rules and guides are well provided. Recently, mining operations in Korea are going underground due to the environmental regulations and resource depletion at shallow depth, and therefore there is a growing demand on a specialized and systematic guideline for mine opening design securing the underground stability. 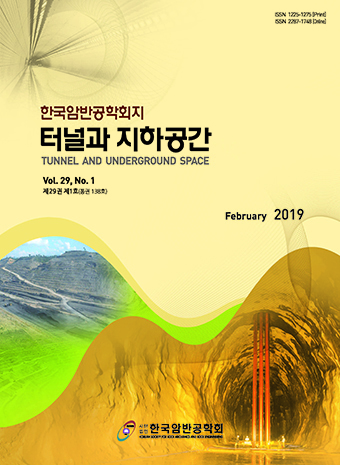 In this paper, current status of mining industry, research trends, and mining guidelines in Korea and overseas have been reviewed to give an insight into developing a new Korean guideline for underground mine design. Barcelona Basic Model(BBM)은 응력의 변화에 따른 부피변화뿐만 아니라 흡입력의 변화에 따른 팽윤 거동을 설명할 수 있으며, 흡입력 변화에 따른 점착력과 선행압밀응력의 변화와 온도변화에 따른 선행압밀응력의 변화를 고려할 수 있다. 따라서, 고준위방사성폐기물 처분시스템에서 공학적방벽재로 고려되고 있는 벤토나이트 완충재의 열-수리-역학적 복합거동을 예측 및 분석하는 것에 많이 활용되고 있다. 그러나 우리나라의 암반 및 지반 공학자들에게 잘 알려져 있지 않기 때문에 BBM을 소개하고자 한다. BBM은 불포화 토질의 역학적 거동을 모사하기 위해 Modified Cam Clay(MCC) 모델을 확장하여 만들어 졌기 때문에 본 고에서는 먼저 MCC 모델을 간략하게 소개하고, 열-탄소성 모델인 BBM을 상세히 소개하였다. Barcelona Basic Model (BBM) can describe not only swelling owing to decrease in effective stress, but also wetting-induced swelling due to decrease in suction. And the BBM can also consider increase in cohesion and apparent preconsolidation stress with suction, and decrease in the apparent preconsolidation stress with temperature. Therefore, the BBM is widely used all over the world to predict and to analyze coupled thermo-hydro-mechanical behavior of bentonite which is considered as buffer materials at the engineered barrier system in the high-level radioactive waste disposal system. However, the BBM is not well known in Korea, so this paper introduce the BBM to Korean rock engineers and geotechnical engineers. In this study, Modified Cam Clay (MCC) model is introduced before all, because the BBM was first developed as an extension of the MCC model to unsaturated soil conditions. Then, the thermo-elasto-plastic version of the BBM is described in detail. 국가의 금융 정보나 의료 정보와 같이 국가 차원에서 안정성을 확보하고 주요하게 다뤄지는 자료는 안전한 보관 및 관리되어야 하므로 이를 위해서는 벙커형 지하 데이터센터를 건설하는 것이 요구된다. 특히 국가 차원의 데이터센터는 지진과 같은 외력에 의해 데이터센터의 기능이 마비되는 것을 방지하는 기능과 이를 충분히 관리할 요건을 갖추어야 할 것이다. 따라서 자연 위협이나 인적 위협에 대한 데이터를 안전하게 보관하고 지하 공간이 갖는 장점을 활용하여 각 국가에서는 지하 데이터센터를 건설하고 있는 추세이다. 본 보고에서는 이러한 세계적인 데이터센터 현황과 동향을 분석하고 우리나라가 진행되어야 할 전략에 대해 검토하였다. It is highly in demand to establish a bunker-type underground data center to ensure the safety of national critical data, such as financial information and medical information, and prevent those outflow of national important data. In particular, the security of a data center which is a key national structure has become a social issue due to EMP weapon and earthquakes, but data centers in the nation have not been able to deal with it properly. Therefore, it is necessary to develop an underground data center that is safe from human-induced and natural disasters while reducing power costs by utilizing the benefits of underground spaces such as constant temperature and isolation. 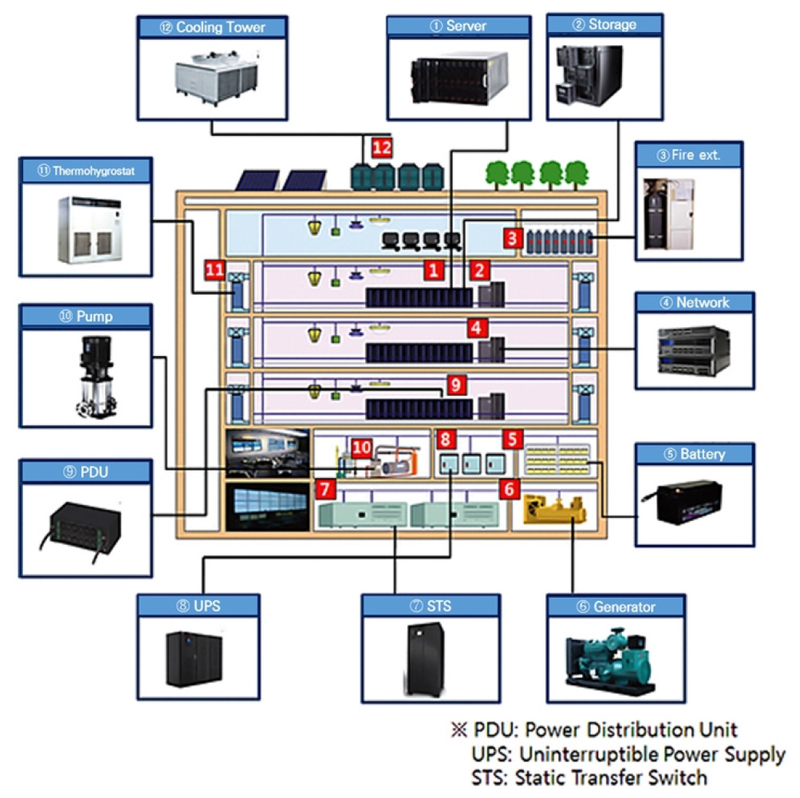 In this analysis, the status and trends of data centers around the world were analyzed and based on those trend analyses, the research strategy for underground data center were discussed. 지하공동의 굴착 과정에서 암반 절리로 인해 생성되는 암석블록의 거동 여부는 지하공동의 역학적 안정성에 있어서 중요한 요소이다. 본 연구에서는 대심도 지하공동 조건 하에서 지체응력 및 절리물성 조건에 따른 암석블록의 거동 안정성을 정량적으로 분석하였다. 이론적으로 계산된 암석블록의 거동조건과 3DEC 수치해석을 통해 분석된 암석블록의 거동양상을 비교하여, 이론값과 수치해석 결과간의 오차를 지체응력 및 절리물성 조건에 따라 분석하였다. 암석블록의 거동 안정성 분석을 수행한 결과는 수치해석 결과와 비교할 때 약 5% 이하의 오차를 보여 본 연구에서 제시한 이론적 방법론의 적용가능성을 검증하였다. Behavior of a rock block consisting of rock joints during excavation of an underground opening is an important factor for the mechanical stability of the opening. 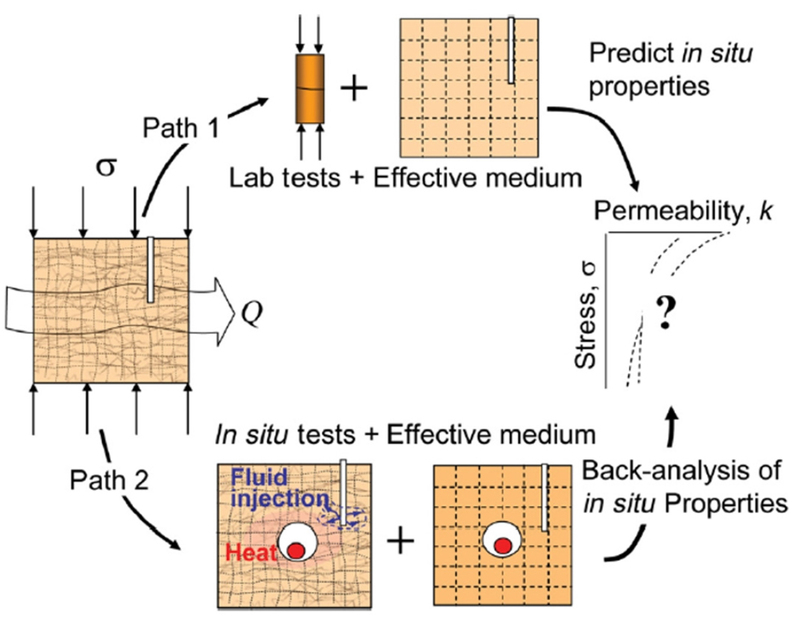 In this study, the behavior of a rock block under different geostatic stress and joint property conditions was analyzed quantitatively. The behavior of the rock block analyzed by 3DEC numerical analysis was compared with that of the theoretical calculation, and the error between the theoretical value and the numerical analysis result was analyzed under various geostatic stress and joint property conditions. The result of the stability analysis of a rock block showed less than 5% of error with numerical simulation result, which verified the applicability of the purposed analytic solution.